Kioti Mechron UTV – The Mechron is a great diesel UTV for around the house or on the farm. 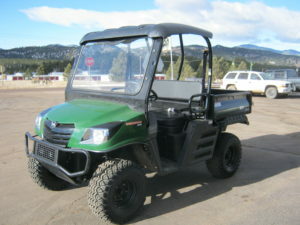 This unit comes with heavy duty tires, brush guard, wide steel cargo manual tilt bed. This is 4WD and has a 1100# capacity for the bed (1598# payload), rear receiver hitch with 1300# towing capacity. 12 inch ground clearance, rear protective screen, sun canopy and front glass windshield.